Here, only the most important directories in the system will be presented. /bin is a place for most commonly used terminal commands, like ls, mount, rm, etc. /boot contains files needed to start up the system, including the Linux kernel, a RAM disk image and bootloader configuration files. /dev contains all device files, which are not regular files but instead refer to various hardware devices on the system, including hard drives. /etc contains system-global configuration files, which affect the system's behavior for all users. /home home sweet home, this is the place for users' home directories. /media is intended as a mount point for external devices, such as hard drives or removable media (floppies, CDs, DVDs). /mnt is also a place for mount points, but dedicated specifically to "temporarily mounted" devices, such as network filesystems. /opt can be used to store additional software for your system, which is not handled by the package manager. /proc is a virtual filesystem that provides a mechanism for kernel to send information to processes. /root is the superuser's home directory, not in /home/ to allow for booting the system even if /home/ is not available. /sbin contains important administrative commands that should generally only be employed by the superuser. /srv can contain data directories of services such as HTTP (/srv/www/) or FTP. 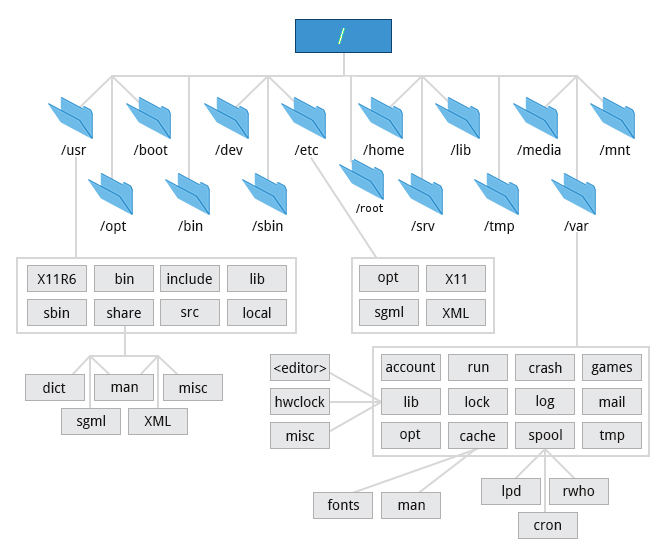 /sys is a virtual filesystem that can be accessed to set or obtain information about the kernel's view of the system. /tmp is a place for temporary files used by applications. /usr contains the majority of user utilities and applications, and partly replicates the root directory structure, containing for instance, among others, /usr/bin/ and /usr/lib. /var is dedicated to variable data, such as logs, databases, websites, and temporary spool (e-mail etc.) files that persist from one boot to the next. A notable directory it contains is /var/log where system log files are kept. Please refer to the Filesystem Hierarchy Standard (FHS) for Linux for this. /bin : For binaries usable before the /usr partition is mounted. This is used for trivial binaries used in the very early boot stage or ones that you need to have available in booting single-user mode. Think of binaries like cat, ls, etc. /sbin : Same, but for scripts with superuser (root) privileges required. /usr/bin : Same as first, but for general system-wide binaries. /usr/sbin : Same as above, but for scripts with superuser (root) privileges required. The local path means it's not managed by the system packages. (ex: make install). use ~/bin (a personal bin folder in your home directory). Tertiary hierarchy for local data, specific to this host. Typically has further subdirectories, e.g., bin/, lib/, share/.